Equipped with a new teaching certificate, foreign students from around the world will be ready to teach Turkish in their home countries. Speaking to Anadolu Agency (AA), Abdulmalik El Salemi from Yemen said that he is glad to be in Turkey to pursue his master's degree in Turkish language and literature. After the training, he said he wants to teach what he knows back in Yemen. 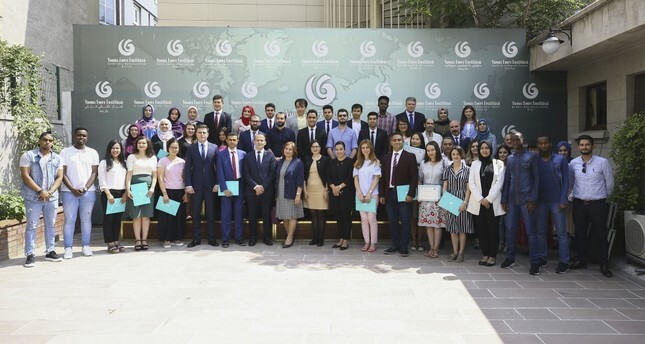 "I can teach Turkish well," said Megi Manuelidze, a Georgian student who earned her bachelor's degree in Turkish language and literature in her country and is doing her master's at Ankara's Hacettepe University. Madine Moldasheva, a doctoral student from Kazakhstan, also praised the training and vowed to teach Turkish in her own country. "I had no problem learning Turkish, and the YEE's certificate program was very good," she said. "I got a good education in how to teach the Turkish language, including what methods and skills to use."